rec. live 1987, St. James’ Church, Stockholm; 1983, Osseby-Garn Church; 1993, Berwald Hall; 2009, Stockholm Cathedral; 1979, Adolf Fredrik Church, Stockholm; 2016, Parish Hall, Stockholm Cathedral. By an irritating and painful irony, I started listening to this CD in very early March when, according to the meteorological office, Spring had officially begun, but outside the temperature, including wind-chill factor, was minus six, and the daffodils and snowdrops lay invisibly embedded in a pall of snow and frost. 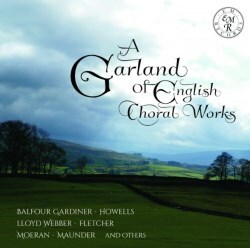 This CD presents several works inspired by springtime, not least “It was a lover and his lass”, where comparison can be made between settings by Morley and Joe Horovitz. There are, however, several sacred pieces, which is apt because and I am also listening in the season of Lent. The longest and most moving work is Howells’s Requiem, which tears one’s heart to pieces. The Requiem was for his dear son, Michael, who died so young; although it dates from 1932, the composer did not feel ready to have it published until 1980. The Nicolai Choir are Swedish but there is no problem with their English diction; however, there are a few other flaws. The soloists are the least impressive in tone quality and intonation, and at the start of movement six (“I heard a voice from Heaven”) the tenor rushes unsympathetically, quite contrary to the composer’s marking, ‘Slowly and evenly’. The choir captures the spirit and mystery of the music but they lack rhythmic incisiveness, so the subtle syncopations lack clarity. The basses have a convincing bottom D and E but the sopranos occasionally seem rather stretched, as in the closing bars of Holst’s Evening Watch. This is a notoriously challenging piece to tune; otherwise the choir manages those problems well. Margery and The Moon, works by William Lloyd Webber, are rarities; indeed, these are premiere recordings. The words are by W.H. Davies, as great a nature writer as he was a poet. The choir seems on less good form here and although Francis Pott’s commentary makes a good case for these pieces, I find them unremarkable. Nevertheless, it is good to have them available. I knew of Percy Fletcher only by name via his quite famous ‘Epic Symphony’ for Brass Band; he was a major composer for brass and wrote a carol called ‘Wild Bells’ that I used to enjoy as a boy. The extended choral work here is an extract from his forgotten oratorio The Passion of Christ; despite the learned fugue towards the end, I’m not convinced that it is worth reviving. What makes it tricky is that the words sung do not bear much resemblance to those printed in the booklet and the choir’s diction is not really clear; even so, it is good to hear the piece. The choir also copes well with Warlock’s famously difficult All the flowers of Spring, which Cecil Gray branded as ‘unperformable’; the tuning is quite a challenge. One of the great pleasures of this collection, however, is the wonderful booklet, consisting of fifty pages. Each composer is pictured, with full texts, a short comment about the music, and biographical notes by a wide variety of enthusiastic writers; apart from the occasional duplication, they are quite exemplary. I first thought it somewhat curious that EM Records, which sets out to promote British music and musicians, had chosen extracts from no less than six concerts over a thirty year span, performed by a choir from Stockholm who one would have thought to be new to this repertoire, but I suppose it is good to know that British music of this fame and quality is being heard in Scandinavia. I am a regular visitor to Sweden and Denmark and have never heard any British works there, so in future I shall look out more carefully for this choir and indeed any others. This disc also serves as a tribute to the choir’s long-standing conductor Christian Ljunggren, who died in February 2017 and was, amongst other positions, for twelve years president of the Swedish Choral Directors Association. The choir he founded is about thirty strong and pictured within. Although the recordings in this compilation were made at disparate times, you won’t have to adjust the amplifier but will notice changes in the acoustic and the tone quality of the choir.